On October 29, Texan by Nature and our founder, Mrs. Laura Bush hosted the first annual Conservation Wrangler Summit and Celebration. This important event brought together over 200 Texas leaders to engage in a thought-provoking summit exploring the beneficial connection between conservation and business. 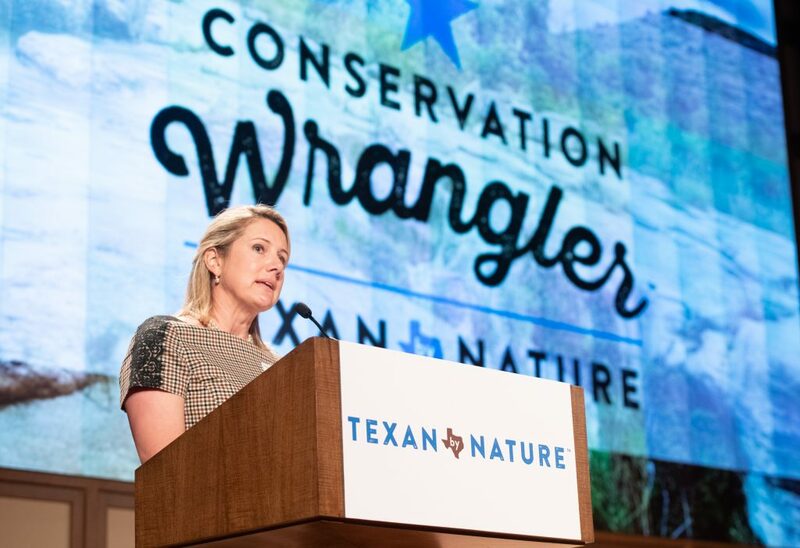 The event culminated in a gourmet meal and celebration of the 2018 Texan by Nature Conservation Wrangler projects. After Texan by Nature’s Executive Director, Joni Carswell’s remarks, Texan by Nature’s Board President, Tina Buford took the stage. I have had the pleasure of serving on the board since its inception and working alongside some of the most passionate, common-sense conservationists has been very rewarding. I continue to learn from each one of you every day. But most of all, thank you to Mrs. Bush, who all of you will have the opportunity to hear from in a few minutes, for your vision for and commitment to Texas’s land, water and wildlife. There are a lot of wonderful projects across this state where conservation is taking place and many of our partners are leading those projects. They may be species specific or focused on a particular ecosystem but what about the bigger picture? What about how the public at large or the business community that makes day-to-day decisions that impact our natural resources, our long term prosperity, our health? We aim to involve everyone in the bigger picture. When we started Texan by Nature back in 2011, we recognized a gap between conservation, business, and community. We believed and still believe that realizing the ultimate success for Texas, our economy, our people, and our land means tying the three pieces of the puzzle together. When our people, businesses, and natural resources are working together – we all benefit. When we make conservation a characteristic of who we are as Texans, there is no limit to possibilities. In late 2017 we made organizational changes to achieve our mission. We brought in a new Executive Director with a significant background in business, technology, and strategy. We believe pairing this with our board and staff knowledge of conservation across Texas sets us up to realize our mission with you – leaders from all across our great state. I’m pleased to share that we’ve made significant programmatic updates and progress this year. This summit and your participation is a key example of this. One update that I’m particularly excited about is the leadership roundtable series we launched in San Antonio in March. At each leadership roundtable, we bring together business leaders from the local community to discuss the concept of Return on Conservation, which to us is the ideal balance of business, community, and natural resources working together. We believe that $1 into conservation is much more than $1 in return – in terms of direct financial impact, health impact, and natural resources impact. These roundtables provide an opportunity for us to involve business and build relationship with businesses across Texas for us to better understand current business practices and shape the role conservation is playing in decision-making. Many of the sessions you’ll have the opportunity to take part in today are a direct result of lessons learned at the roundtables and a desire from all communities to hear real world examples and results and engage in dialogue and learning with one another. The leadership roundtables along with our Conservation Wrangler program, TxN Certification, and the Center for Health & Nature provide tangible examples of business, citizens, and conservation groups working together to advance all. Seeing our mission executed at both the thought leadership and programmatic level is beyond exciting, and gives me hope that in Texas we truly can find a balance. Thank ALL of you for joining us today and being Texan by Nature. I encourage you to learn during our breakout sessions today and share your own stories as well. The leaders surrounding you today are an equal split between businesses operating across Texas and conservation organizations. This is an opportunity to make new connections and take new thoughts back to your teams.